Director: Robert Zemeckis. Cast: Denzel Washington, Kelly Reilly, Nadine Velazquez, Brian Geraghty, Bruce Greenwood, John Goodman, Don Cheadle, James Badge Dale. After a long 12 years hiatus during which he only directed animated features (The Polar Express, Beowulf, A Christmas Carol) director Robert Zemeckis is finally back to live action film-making. I say finally because I must confess I have always had a bit of a soft spot for his films: Back to the Future has of course been on the top of the list of my favourite films since 1985, I have also fond memories of a both Romancing the Stone and Who Framed Roger Rabbit, I cry every time Tom Hanks looses his ball in Cast Away, and despite its many flaws, I still think Contact is a marvel when it comes to camera moves… and then of course the multi-Oscar winner Forrest Gump, a film many people adore (and from which I’ll distant myself, because I seem to be the only one who has some serious issues with it). So basically, I came into this with a certain trepidation, having only seen the trailer once on the internet and thus expecting a slightly different film than the one I actually got. Flight opens with a gritty, dirty, squalid and pretty-realistic sequence featuring our Denzel Washington definitely not looking at his best, surrounded by all sorts of alcoholic beverages and a naked lady wandering about a soulless hotel room near an airport. Once the first few lines of dialogue start, they include straight away some f**k and s**t . It’s as if Zemeckis is almost trying to prove right from the start to his audience that he’s really left the kids stuff and 3D animated wizardry of his last few years behind and this is a now a serious film for grown-ups. After this new signature intro we move on to what this film is going to be remembered for and possibly one of the most harrowing, nail-biting flight-disaster sequence since… well, probably Zemeckis’ own Cast Away! I’m not saying that we haven’t seen this sort of things before, of course (Final destination, Alive, Fearless, just to mention a few) but the prolonged nature of this flight-disaster sequence makes it somehow even more powerful and harrowing than I was expecting. Whatever other issues I have with the rest of the film, this is a first class sequence. Zemeckis has always known how to stage action set pieces and keep his audience glued to the screen and crank up the tension to almost palpable levels and in the end this sequence becomes certainly no less memorable than the one where a DeLorean is speeding through 88Mph to get to the clock tower in time for the lightning to strike (hope you’re with me with this parallel… and if you’re not, what on Earth are you doing on a site called MovieGeekBlog?!). However very little after that, Flight slowly (in fact quite slowly as the film clocks at around 138 minutes) becomes something quite different and actually turns into a rather conventional film about a drinking addiction and predictably starts to go through all the motions and the classic steps of the genre: lots of drinking, denial, hitting rock-bottom, relapse and of course redemption (this last part incidentally is the one I have more problems with). Don’t take me wrong, there’s nothing here that it’s bad, but I do wonder if it hadn’t been for Denzel Washington’s exceptional performance whether this film would even be considered for the forthcoming award season. Indeed Washington hasn’t really been this good since his Oscar-winning performance in Training day (In fact I would argue this is a much more difficult part to pull off). John Gatins’ script is a mixed bag: on one hand it manages to craft a whole series of interesting and carefully calibrated moral ambiguities (this is really the winning part of the film: do you treat Denzel as a hero for saving many lives, even though he was drunk while doing so?). On the other hand, the film is also peppered with some shameless (even rather effective) melodrama. Unfortunately the story moves almost in fits, as it starts and stops and constantly loses its momentum as various characters come in and out sometimes quite randomly (including an interesting but very redundant sequence with an almost unrecognisable James Badge Dale playing a hospital patient dying of cancer). The film shifts even into parody and almost slapstick with the admittedly very funny John Goodman, but he’s only there for a couple of out-of-place sequences and once he’s gone the film goes back to its original pace. Finally, Kelly Reilly, Don Cheadle and Bruce Greenwood all give the movie some great support power despite some of them being terribly underwritten (particularly so in the case of Kelly Reilly). The soundtrack is made of a fairly restrained score by the director’s favourite Alan Silvestri and a whole series of older classic songs, something which worked perfectly on Forrest Gump. But while on that one it made perfect sense to have such a top-of-the-pop for the decades, here it felt to me just like an excuse to sell its soundtrack CDs and it’s all quite random. Eventually, the climax feels a bit overblown and its resolution all too clean and feels quite inevitable. The film also has an extra coda (something to do with Denzel’s son) which I could have definitely done without, and where the old Zemeckis sentimentality from again Forrest Gump seems to resurface. But it’s hard to dismiss this film altogether: it’s got the heart in the right place, it’s well made, perfectly acted and, for most of it, it’s well handled. Ironically the film really seems to fly when with the crashing of the plane, but where it should actually be uplifting and soar, it can’t quite take off. Director: Sam Mendes. Cast: Daniel Craig, Ralph Fiennes, Judi Dench, Javier Bardem, Ben Whishaw. Heralded as the Best Bond film in over a decade, or possibly even the best Bond film ever, accompanied by a series of positive feedback and reviews from early screenings and a marketing campaign that only a 007 film can have (before my screening I counted at least 7 different Bond-theme adverts! 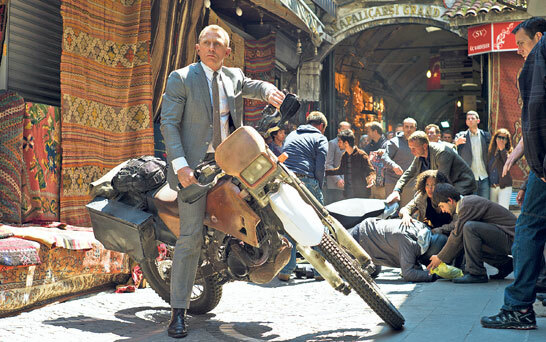 ), Skyfall finally opens to the public. Right from the word go, you can tell you’re in for something special: as we’ve now become accustomed, the opening sequence is absolutely spectacular. A never-ending chase, through the streets of Istanbul, along the labyrinthine corridors and over the rooftops of the Grand Bazar, and finally on a moving train, ending with a bang, literally! Bond gets shot from the distance and falls off from the moving train, over a bridge down to some deep waters below… How on earth can he have survived the fall is never really explain, but hey, who cares, it’s Bond, James Bond. Logic and plausibility should have been left outside the theatre, before coming to see the film. Later on there will be another impossible escape from a prison, which once again, will not be explained. But then again, the film moves so fast, that it almost doesn’t matter. However the film never really reaches the heights of that first sequence in terms of action (almost as if the budget had been all blown on that). The other set-pieces throughout are pretty standard fights, shootouts and simpler chases. However what really makes this Bond quite special is its mood, its splendid cinematography (including an ingenious one-take-wonder-fight in silhouette against the backdrop of some flashing neon lights from some advert on a building in Shanghai), but above all, the central relationship between Daniel Craig and Judy Dench. It’s ironic that across all the 23 films, the 77 years old Judy Dench could possibly be my favourite Bond Girl. Ruthless, ice-cold, incredibly charismatic and this time vulnerable too. I will not spoil the ending (though you can see all the various twists coming miles away), but by the time the credits roll, she will be the real star of the movie. Skyfall (Incidentally, for some reason I had missed the name of the house in Scotland and I cound’t quite work out the reason behind this title) also sees the return of Q (though as Bond rightly says it’s not really Xmas as far as gadgets go), this time as the new geeky young techy genius played impeccably by Ben Whishaw. It all makes me really hopeful for the next future instalments (apparently two more movies are already in the pipeline after this one, with the next one already in production ready for a 2014 release). And of course no Bond is complete without its baddie and Javier Bardem is one of the best we’ve had in a while. Over-the-top as only he can be, Bardem shares a classic intimate scene with Bond which will be remembered forever: a brave scene, considering Bond’s history, but also brilliantly funny! Despite the above mentioned sequences in Istanbul and Shanghai, British director Sam Menders decides to play most of the film at home and London is where most of the film takes place. It’s the London we all recognise, with its rain, its Millemiun Wheel, its Houses of Parliament and Big Ben, its Gerking skyscraper standing above the city-line and its iconic “tube” at rush hour which plays as the setting for another chase, though this one rather unremarkable (I must confess, the only fun for me this time was to try to recognise all the various stops). The film gets more and more intimate, the more it unravels, something which is quite unlike any other Bond movie before, where usually the third act is reserved for the big reveal of a massive lair, or some secret base somewhere in some hidden location. This time we end up in rural Scotland. Nothing wrong with that, of course. This is a more intimate 007 film, one that focuses more on personal relationship and people rather than dastardly plan from some evil master of crime. Having said that , there is something slightly under-whealming about this last 30 minutes and in the end I couldn’t help feeling a bit let down (especially given the fact that it ended in exactly the way I thought it would… Including the twist).However, we even get given a little bit of a hint into James Bond’s background, something which has escaped us for 23 film, and though it was all just a fleeting moment, it was also a nice welcome novelty into a character who we think we know much too well. And of course, to complete the mix, we’ve got a shaken Martini, a splendid Aston Martin (with its music cue right from the 60s), the classic “Bond, James Bond” line and a couple of cold jokes (though we are still quite far from the Roger Moore fun-fest). Daniel Craig, now on his 3rd outing (4th if you count his appearance with the Queen at the Olympics), inhabits Bond to perfection, whether he wears his tuxedo or not. The blink-if-you-miss-it moment where he adjusts his cufflinks right after landing on a smashed train is played to perfection both in terms of timing and tone. Never for moment I regretted I didn’t have Connery, or Moore, or Brosnam (I’m not even going to mention the other two…).Daniel Craig is James Bond! Slightly shortchanged are the actual Bond Girls this time. Sévérine, played by Bérénice Marlohe is of course beautiful, but ultimately rather forgettable. Eve (Naomie Harris) is a much stronger character (I bet any Bond fan will be able to guess the twist much before it will actually be revealed), but I couldn’t help having a certain detatchment towards her and to be honest I could not care less whether she had lived or die. In the end, this is one of the stronger Bond movies we’ve ever seen, though certainly not as Oscar worthy as the hype wants us to believe it is (though Judy Dench might get nominated and probably some technical nods will come its way too). It is enjoyable, tense, thrilling, always intriguing, but I must say, it won’t be one of those I will watch over and over again (aside from that amazing opening).